The Easter Road side created plenty of chances in their cup win over Elgin City. 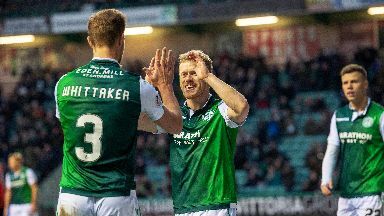 Hibs assistant manager Garry Parker believes his side should have racked up a bigger scoreline after they beat Elgin City 4-0 to move into the Scottish Cup fifth round draw. Daryl Horgan scored twice, with Florian Kamberi and Stevie Mallan also on the scoresheet against the League Two side. Parker was impressed by winger Horgan but said that the team had to be more clinical as they look to improve in the second half of the season. He said: "We had more than a few more chances to score so it should have been more. "We can't do anything about missed chances but hopefully we will get a few on Wednesday at Motherwell. "But it's a clean sheet and the most important thing is that we won the game. "Horgan was good, he scored two goals and one of them was even a header so he did well. "It's not just Daryl who we need to have on form for the second half of the season, we need everyone to push if we are to get into the top six. That's the target and that's what we've told them." Ryan Gauld made his debut in the match after joining on loan from Sporting and Parker said that it was clear that he could bring creativity to the side. "You could see with Ryan that he's a clever player," he said. "He can see a pass and that's what we've been missing. "You can see he's going to be a player who will make a difference for us. His pass through for the Kamberi goal was excellent and he finished it well." Elgin City manager Gavin Price was relieved that his side came away without a morale-sapping heavier defeat. "I thought we stuck to our task to the end and as the game went on we started believing in ourselves," he said. "The fourth goal went in fairly early in the second half and you start to fear. It can damage your confidence if you come out with a hiding but I was pleased with the way we finished the game."